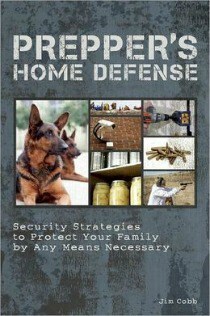 “The longer it takes for an attacker to get through your defensive measures, the more time you have to detect them and implement additional security protocols.” With this sentence, Jim Cobb sets a serious survival tone for the book “Prepper’s Home Defense“. Jim Cobb’s book, Prepper’s Home Defense, shows you step by step how to implement a complete security plan to defend your home or property in any disaster, from super storms with major power outages to a complete societal collapse. This book not only covers the physical security issues that you must resolve but also operational security including “Mutual Aid Agreements” that you agree to with your neighbors to defend your neighborhood or property against undesirables. This well thought out book starts with basic security concepts and then moves to your outer most security concerns, perimeter defense. From there, the book peels back each layer of your security until you are face to face with the Mutant Zombie Bikers invading your innermost sanctuary. When all is lost, Jim also covers “Bugging Out” with advice on advanced planning and travel routes from your primary location to your bug out location. I love how he starts this chapter off, “In spite of all your best efforts, advance planning, and extensive prepping, you may find yourself in a situation that you and your family are unable to deal with.” This is something that every survivalist should consider, often we get so wrapped up in our extensive plans that we forget to be flexible and won’t consider changing our plans until it is too late. This is something that I had to remind myself of often during my time in the Marine Corps, the best laid plans rarely survive the initial shot, be flexible. (From the book): Jim Cobb has worked in the investigation and security fields for twenty years and has been a survivalist most of his life. His articles on preparedness have been published in national magazines such as Boy’s Life. You can find him online at www.survivalweekly.com as well as blogging for www.survival-gear.com. Jim lives in the upper Midwest with his beautiful wife and their three adolescent weapons of mass destruction. I enjoyed this book, Jim spent just the right amount of time on firearms without making this another book on firearms. I have to say my favorite part of the book was the section on “Mutual Aid Agreements”. This is something that has always been on my mind but I have never been able to put it into words. Jim lays out how to start off the conversation with your friends, which maybe uncomfortable at first, and then how to put it into writing with your trusted friends or neighbors. If your home or property is attacked by an unknown enemy force, nothing can change the outcome of the fight faster than another friendly force attacking the enemy from a direction that completely surprises them. Mutual Aid Agreements can be a powerful tool in your prepping plans and should not be overlooked. I did not really have any major dislikes on this book. The title says it all “Prepper’s Home Defense“, this book did not go in depth on food storage, water purification, alternative energy, etc. It stayed true to it’s title of home defense in a SHTF situation, which I appreciated. I would have been disappointed if Jim had tried to make this an all in compassing survival manual but he did not. He stuck to the title and made this book a baseline for home or retreat defense during TEOTWAWKI. If you feel that your home defenses are inadequate or you want another take on home defense then “Prepper’s Home Defense” is for you. This is not your run of the mill, “Keep Burglars Away from Your Home”, this is home defense for SHTF events or even the worst case scenario, TEOTWAWKI. Jim proves his knowledge on retreat defense with a layered approach to physical security as well as how to operate an around the clock security team with patrolling and SOPs (Standard Operating Procedures). You and your family will be better prepared with the knowledge you gain from this book.